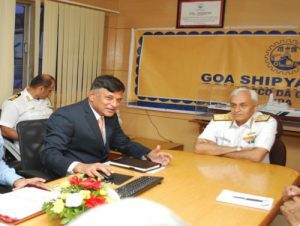 Admiral Sunil Lanba PVSM, AVSM, ADC, Chief of Naval Staff of the Indian Navy visited GSL on 20th April 2017. During his maiden visit to GSL, Admiral Sunil Lanba was briefed by RAdm Shekhar Mital, NM, IN (Retd), CMD GSL on wide ranging issues including progress of Export Projects, Advancement in operational features incorporated in ongoing CGOPVs over NOPVs, Project 1135.6, ongoing refit of INS Tarangini & Spare Production capacity at GSL. CMD, GSL gave detailed presentation to CNS on present capabilities and future outlook of GSL in the presence of Directors and Senior officers of Navy. Admiral Lamba was conducted around the shipyard by RAdm Shekhar Mital, and was also taken to vessels under construction for exports. 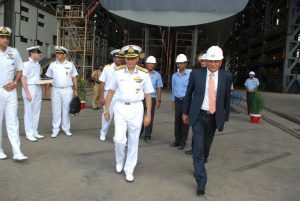 The CNS visited MFPV under final stages of construction and interacted with Mauritius Commanding Officer. The ship is scheduled to be delivered to Mauritius Coast Guard by end of Apr 2017, 3 months ahead of contractual schedule. CNS also reviewed preparation/ongoing work on MCMV Project. He was briefed about the progress of dedicated Infrastructure being built for MCMV Project along with negotiations on ongoing ToT contract & MCM Suite. The CNS expressed happiness with the progress of the work and was also shown the state of the art R&D/Virtual design center- seat of Innovation in GSL. CNS advised on steps to be taken for compliance of NES standards stringently on all new Naval projects. Admiral Sunil Lanba appreciated GSL on the quality of ships being built, pace of work and workmanship of the yard. The Shipyard has been recently nominated for high end Missile 1135.6 Frigate Project to be made in collaboration with Russian Shipyard. High level delegations from Russian side have visited GSL recently and have appreciated the infrastructure and expertise available with the shipyard. Formal discussions between GSL & Russian side is scheduled from 24th Apr for a week at Goa.